Amit Ramani (43 years) is now a global citizen. He is an alumnus of School of Planning & Architecture, Kansas State University. He also went to Manhattan Kansas, Cornell University, Ithaca, New York. The unrelenting desire to provide quality workplaces at best locations on a just-in-time basis drove Ramani to launch Awfis in 2015. A Delhi-based new-age venture, Awfis provides ready to use, plug and play, pro-working office spaces. Earlier Ramani was the COO of NELSON Global leading 37 global locations and over 600 people. Raman is a frequent speaker to industry forums such as CoreNet Global Summit, a guest lecturer at Cornell University, New York University and Texas A&M. He has published work in the Journal of Corporate Real Estate. An in depth interaction with Baishali Mukherjee captured the corporate turned entrepreneur’s regaling journey. With rapid urbanization, burgeoning traffic, increased travel times, ‘Anywhere Workspace’ is the new normal. The real estate industry is adopting the shared economy model. This allows consumers to utilize real estate on a truly ‘Just in Time’ and Flexible basis. The idea germinated during my consulting days when alternative office solutions were the need of the hour. In India, SMEs and startups face challenges of having decent infrastructure at cost- effective prices. The business was started with the goal of providing new age and technology enabled workspaces. Awfis is a new-age venture providing ready to use, plug and play, pro-working office spaces. It is embedded with the latest technology solutions for flexible and ‘just in time’ space utilization. We are focused on redefining the way work gets done in the current business environment. Awfis aims at providing an environment of inspiring spaces for the working population and corporates. We provide everything that an office user will require, at extremely competitive costs making “Awfis as the new office”. Members of the Awfis platform significantly benefits from being part of the “Awfis Community”. The spaces provide opportunities to network, ideate, and collaborate with like-minded entrepreneurial talent across varied business segments. Awfis was founded and funded with investment from The Three Sisters: Institutional Office (‘TTS:IO’) with a total capital investment of USD 11 million in April 2015. TTS:IO is an institutionally organized family office founded by the three daughters of Mr. Rana Kapoor – Founder of Yes Bank (Radha, Raakhe and Roshini) with the stated objective of incubating ‘new-age’ creative businesses. We have recently secured $20 MN from Sequoia for the expansion of our operations. It’ll help us add about 75 – 80 more centers to our existing offering. Sequoia does believe that Awfis is playing on two significant global trends – sharing economy and communities. This being delivered through a superior user experience at a lower total cost makes it more exciting for them to be interested in the business. The current funding will allow us to reach about 25,000 odd seats, which will include the 7,500 that we have today. It’ll help us reach to about 70-80 centres. Beyond that we will have to look at additional funding to reach our goal of 35,000 seats over 100 odd centres in the next 18-24 months. In a short span of two years, Awfis registered 5000+ professionals in its member base coming from 500+ companies. They include large corporates, SME’s, startups and the freelancer community. We currently operate 7500+ seats. It is slated to go up to 10000+ in the next 60 days and 25000 in 12 months. All our centers have seen high influx of space demand. Today most of our centers run at 85-90 per cent occupancy within the first 90 days of operation. We have plans to enter the tier II market in the next few months. Once mobility becomes part of the way work gets done we will take our 21 centers to 100 centers in the next 18-24 months. Presently we are only a co-working player offering co-working solutions within a 10-minute radius. We operate across 10 major cities and hubs from 7 metros including Noida, Gurgaon, Delhi, Mumbai, Bangalore, Chennai, Pune, Kolkata, Hyderabad and Chennai. Our competent and strong pedigreed team of 170 members maintains highest quality standards and smooth operations. As a company, we have onboarded people from across industries. It ranges from not just real estate but BFSI, hospitality and retail backgrounds. The team brings in experience with innovative solutions and an ability to work in a fast-paced environment. We are now a more robust team, attracting talent from leading institutions with an eye towards becoming the employer of choice. The primary revenue model is the rental from conventional workspaces. It includes completely customizable office space to standalone seats, cabins and meeting rooms. We also offer mobility solutions to the customers. These products are in high demand because of relevance to the business community based especially in the Tier 2 and Tier 3 cities. Additionally, we have in-centre revenue flow from centres run in partnerships with relevant players. Under the Managed Aggregation model, Awfis is aggregating underutilised spaces from owners and converting them into new-age work spaces. Underutilized spaces include – spaces lying vacant due to softened demand, spaces that are transitional as committed in future, shadow vacancies, excess capacities, dead zones (uneconomical sizes) etc. Awfis will continue to create a network of effective, inspiring work places and facilitate the workplace transformation that has set in. Driven by millennials and entrepreneurs, companies are looking at options to make their employees comfortable, engaged and happy. Mobility solutions are also on the cards. This includes the national pass, freedom pass, bulk meeting rooms hours, mobile Awfis (Innova) breaking the mould of one seat. Multiple functions and users give complete mobility to user while enhances space usage and efficiency. The goal is to operate, manage, service and power 250K seats or 25 Million SFT in next three years. 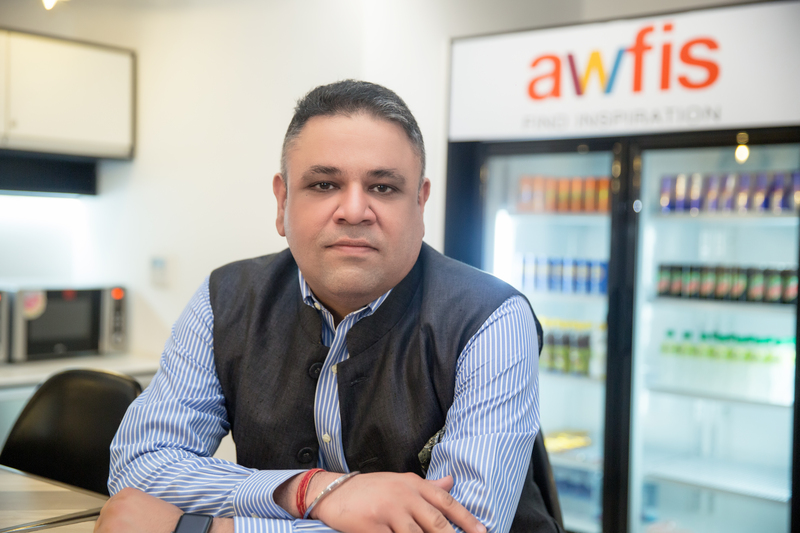 Awfis aims to be the largest landlord in India without directly leasing any space. In a country where space has perennially been a constraint, do you think awfis business model is viable? Do share your views.